Pick any Formula 1 world champion and you will find a common thread — Lewis Hamilton, Sebastian Vettel, Michael Schumacher, Ayrton Senna, Fernando Alonso, Nico Rosberg, Jenson Button and the rest all raced karts before embarking on a main circuit career that ultimately saw them becoming world champions. Closer to home it’s much the same — pick a top driver — David Perel, Eugene Denyssen, Jonathan Aberdein and Johan Fourie — all former WP karters at the top of their game today; Leeroy Poulter, Michael Stephen, Stuwie White, Mark and Gavin Cronje, Kelvin and Sheldon van der Linde or any other leading South African race driver and you will find that they too raced — and often still race karts. The common thread to building a racing career is a strong start in karting — the breeding ground of tomorrow’s racing talent. Local karting offers the perfect road to a racing career and the Western Province Motor Club’s Karting Section is a major contributor to that process — Cape kart racers regularly dominate in the national series and race competitively overseas too. 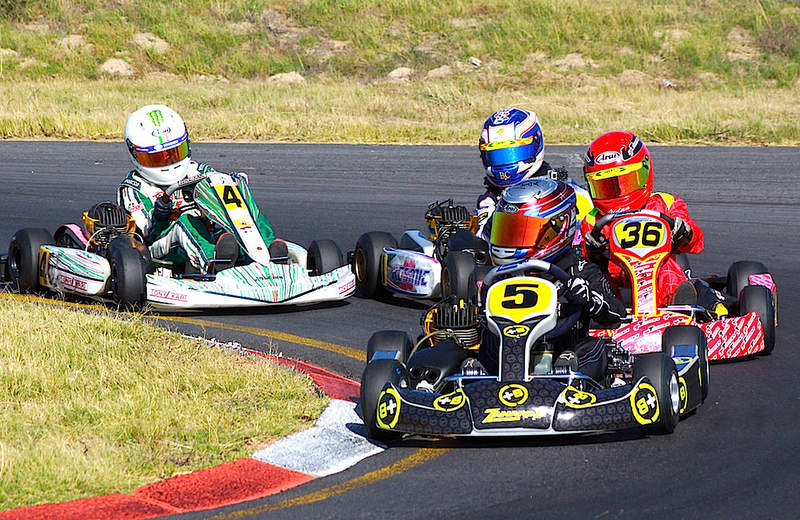 Killarney’s challenging kart track is a thriving complex that supports an enthusiastic Cape karting community and hosts the Western Cape Karting Championships over eight rounds through the year, as well as a round of the South African championships. The WP series also counts toward each driver’s national score, with the South African Championship comprising four rounds, one of which is hosted by the WPMC Kart Club at Killarney. South Africa’s Rotax Max Karting Champions qualify to race the Rotax Max Grand Finals at different venues around the world at the end of each year. The Western Cape Karting Championships is made up of eight classes catering everyone from the under-8 Cadets through to the over-31 DD2 Masters. There are four primary school classes from the baby Cadets racing on a shortened track, through the under-11 Rotax Micro Max, under-13 Rotax Mini Max and under-13 Mini Rok. High school kids race in the ultra-competitive under-15 Rotax Junior Max. Three open age classes include Rotax Senior Max and Cape karting’s fastest class, the direct-drive two-speed DD2s for drivers up to 30 years old, with a separate DD2 Masters class for drivers over the age of 31. Another great Cape karting option is the popular WP Clubmans, which races in three lap time classes with a strong camaraderie amongst competitors in a fun class. Micro Max, Mini Max, Junior and Senior Max and DD2 are also the five South African Rotax Max Challenge National Championship classes, all tightly controlled to ensure a level playing field. Engines comply to a tight specification, karts race on the same tyres, chassis must to stringent regulations and each class races to a minimum weight with kart and driver weighed after each official session to ensure compliance. The WPMC Kart Club has its own committee, chairman and secretary within the Western Province Motor Club and races are run by a MSA graded Clerk of the Course, officials and marshals. The Killarney Kart Track pits support the local karting industry the likes EMR Kartsport and the SA Kart Racing Academy, who form the backbone of local karting support. The track open for practice most days and where you will regularly find tomorrow’s race champions honing their skills. The air-conditioned Kart Café offers good food and refreshments on busier practice days and over race weekends, where great commentary adds to a special atmosphere at the track.